1. What led you to specialize in the study of dark and protective magicks? I’ve experienced paranormal phenomena pretty much my whole life. I can remember seeing ghosts when I was as young as four or five. When you see these things you can either ignore them, go nuts, or learn how to protect yourself and take charge of the situation. I tried and failed to ignore them and I refused to let myself go crazy, so I had to learn more about the magick and the paranormal so that I could be in control of my experiences. I talked to anyone who would answer my questions and voraciously read every book on the subject that I could get my hands on and eventually became something of an expert. 2. How did you end up teaching for the Grey School of Wizardry and acting as their Dean of Dark Arts? I learned about the Grey School back when if first opened in 2004 and joined the school as a student. I loved the fact that it allowed me to work at my own pace and to learn such a tremendous variety of subject. Unfortunately, at the time there wasn’t much in terms of advanced material. I realized that I knew just as much, or more, about the dark arts in general and protective magicks in particular than some of the faculty and decided to apply to teach. I was accepted as a teacher and quickly began writing classes on creatures of the night and defensive magick. When the then dean of the department decided to step down I immediately expressed interest in taking the wheel and the administration deemed me ready to do so. The department now offers 28 classes across 7 levels, with more on the way! 3. What is it like to be one of your students at the Grey School of Wizardry? For example, is it all done online, how structured is it, etc.? The Grey School in an entirely online, work at your own pace, non-denominational magickal school. When a student enters the school they take a few required introductory classes and then they can select up to six classes of their level at a time from any of our 16 departments. We offer classes in everything from lore, to wortcunning, to alchemy, to dark arts. When a student signs up for a class they must be approved by the professor. Once approved they have access to all of the class lessons on the school site. Each class has a number of assignments that must be completed in order and are graded by the professor. The average class takes 2-6 weeks to complete depending on the diligence of the student and the number of assignments. All students also have access to extensive school forums, one of our richest resources. Any question a student may have about any kind of magick can be asked in the forums and will generally get multiple responses within a day. For more information on the Grey School just go to www.greyschool.com. 4. 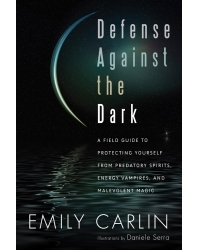 What made you decide that it was time to write your new book “Defense Against the Dark: A Field Guide to Protecting Yourself From Predatory Spirits, Energy Vampires, and Malevolent Magick”? At the time that I started writing the book I had spend around ten years researching the paranormal and ways of protection oneself from it. Much of the material had crystallized in the form of Grey School classes, but there was still a lot more to be done. The catalyst for finally getting everything together into a book was actually my Grey School practicum. When you finish the 7 level course of study at the Grey School you do a large final project: the practicum. For most students this would be performing a ritual or writing a long paper. For me it was to pour the contents of my brain into my laptop and three months later I had a 75 page paper that my poor adviser had to grade. From there it was another month or so to flesh it out to book length and voila, Defense Against the Dark was born. 5. In your book you discuss a classic protective substance, holy water. However, you also mention “war water”, which I had never heard of before. Where did you learn about war water and can you tell my readers a little bit about it? War water is basically the dirty, angry cousin to holy water. Holy water repels negative forces and cleanses; war water will actually harm negative forces – it fights back. I first learned about war water many years ago at a Pagan Pride Day workshop. It was mentioned briefly in a few of the books on psychic protection that I had, but I had a difficult time finding more information. Then, several years later, I found The Element Encyclopedia of 5,000 Spells by Judika Illes and that book had several recipes and directions on how to use it. I make my war water using iron nails, sulfur, several kinds of peppers, blood, salt, and just about any other noxious substance I can get my hands on. I almost always have a vial or two on me, just in case. 6. Your book covers a wide range of malevolent and subversive spirits and creatures. Do you have a particular favorite? My favorite creature tends to shift day to day, but at the moment it has to be The Wild Hunt. There’s something about the image of a great mass of spectral hunters riding through the night that I find rather thrilling. There are a lot of different theories as to what The Hunt really is, anything from ghosts to faeries or even gods, but I prefer the stories where they are a mass of spirits that hunt down evildoers and drag them to their just rewards. I’d like to think that there’s some force out there that makes sure that wrongdoers get what they deserve. 7. Since these people are attempting to seek out things that you write about how to protect yourself from, what are your thoughts on the ever increasing interest in paranormal investigations and ghost hunting? I think paranormal investigations and ghost hunting is great. I’m glad that more and more people are becoming curious about the unknown and are actually looking for concrete answers rather than just telling each other stories. However, this trend also worries me because there are more and more people going to places where negative entities tend to hand out and they have no idea how to protect themselves. The vast majority of paranormal entities out there are not going to hurt anyone, probably 99.95%. Unfortunately, if enough people go out looking for the paranormal often enough, eventually someone’s going to run into that 0.05% of very bad things and I just hope that those folks have taken the care to protect themselves. It’s for those seekers of the unknown that I’ve written this book, so that they can be ready if they become one of the unlucky few to run into something really nasty. 8. What challenges do you see facing the Pagan/Wiccan/Witch community? How can the community resolve those issues? Golly, no small question that one. One of the biggest problems I see facing the community right now is a lack of unity. The Pagan/Wiccan/Witch/Heathen/etc. community prides itself on individuality and allowing everyone to do their own thing. That’s one of the best things about our community – everyone can be what they are – it’s also one of our biggest weaknesses because it’s incredibly difficult to get such individualistic people to come together and actually get anything done. When everyone’s voice gets equal weight it’s very difficult to come to a decision. This is something the community really has to work on if we want to receive the respect and legitimacy that we deserve. 9. Remus Lupin, Severus Snape, or Gilderoy Lockhart? From the books, Remus Lupin because he’s intelligent and courageous. From the movies, Severus Snape because Alan Rickman is awesome. I’ve got a question for you. I’m already hard at work on the follow up book to Defense Against the Dark and it’s going to be a book on advanced magickal defense. What sort of things would your readers most want to see in such a book? I’m honestly not sure, your current book has so much information packed into it! Being kind of a magic nerd, I wouldn’t mind more history and information as to how certain magical defenses came about. Sort of like the information you gave to my war water question. I like seeing how something came to be included in someone’s book or magical arsenal. But that’s just me, let’s see if any Magical Buffet readers have any thoughts on the matter. If you have a suggestion for Emily, just post it in the comments section, it would be nice see what you guys think. 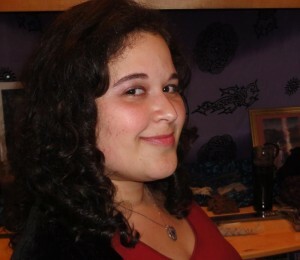 Emily Carlin has been a magickal practitioner for more than a decade. She is the Grey School of Wizardry’s Dean of Dark Arts, specializing in defensive magick and creatures of the night, teaching magickal protection to people of all ages and skill levels. Emily also holds a BA in philosophy from Wellesley College and a JD from Seattle University School of Law, and is a member of the Washington State Bar. Carlin is a lifelong resident of Seattle, Washington.